Do you live in a big city? Enjoy everything it has to offer in the way of jobs, culture, and resources? If so, you’re part of a group of people that numbers in the tens of millions. Unfortunately, cities also have their down side: air pollution. Everyone has experienced looking up the skyline of a major urban center only to see an orange-tinged haze hanging over everything. Most of us have also experienced trying to breathe air that doesn’t seem to have any life-given oxygen in it at all. It doesn’t smell right and it doesn’t feel good when we breathe it in. It comes as no surprise then, that air pollution is the cause of a number of health complaints. While respiratory problems have garnered the lion’s share of the media spotlight, there’s another potentially-threatening physical ailment that’s being talked about in medical circles everywhere. Air pollution is being directly linked to causing cancer. This link isn’t being suggested by just anyone—it’s the World Health Organization that’s making the claim. 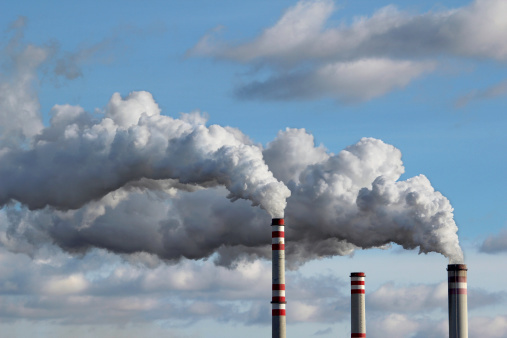 Air pollution has now been tagged as a carcinogen that causes lung cancer. This news is alarming for city dwellers, as air pollution has been put into the same category as asbestos, tobacco, and ultraviolet radiation. Thinking of the air we breathe in the same sentence as these known carcinogens is distressing to say the least. The WHO considers pollution to be the number one carcinogen, ahead of second-hand smoke. What’s in urban air that makes it so toxic? According to the scientists who prepared the report for the WHO, air pollution contains a complex mixture of cancer-causing chemicals. Gases and particulate matter make up this toxic soup. Fine particles are particularly troublesome as they can be deposited deep inside the lungs. Along with vehicle emissions, power plants, industrial processes, and agricultural emissions are the main culprits when it comes to producing a thick blanket of smog. While we can choose to avoid many substances classified as carcinogens, it is impossible not to breathe air. You can confine yourself to the indoors and purchase an air filter. But as soon as you step outside, you’ll have no choice but to breathe in dirty air. Scientists are hoping, now that air pollution has become a worldwide concern, that governments and agencies will step up and enforce stricter emission laws. Public transit needs to be funded so that individual cars driving on the road can be eliminated. Industries need to be held more accountable for the chemicals they release into the air. And finally, agricultural practices need to adopt green methods of fertilization. There are dramatic differences in air quality in most of the large cities around the world. Economic hardships and the need to compete in a global market often force developing nations to ignore emissions laws. Such is the case with cities in India and China. In the U.S. and Canada, progress has been made to clean up the air, but more still needs to be done. Scientists are hoping to zero in on the specific chemicals that are linked to cancer and begin by targeting their removal from the air we breathe. Huo, Q., et al., “Effects of ambient particulate matter on human breast cancer: is xenogenesis responsible?” PLoS One. Oct 16, 2013; 8(10): e76609. Arden, C., et al., “Lung Cancer, Cardiopulmonary Mortality, and Long-term Exposure to Fine Particulate Air Pollution,” JAMA 2002; 287(9): 1,132-1,141. “IARC: Outdoor air pollution a leading environmental cause of cancer deaths,” World Health Organization web site, Oct. 17, 2013; http://www.iarc.fr/en/media-centre/iarcnews/pdf/pr221_E.pdf, last accessed Oct. 23, 2013. “Heavy Air Pollution in Canadian Area With Cancer Spikes,” Science Daily web site, Oct. 22, 2013; http://www.sciencedaily.com/releases/2013/10/131022132147.htm, last accessed Oct. 23, 2013.